Review Now in its third generation, the MacBook Air hasn’t had the same sort of overhaul as the rest of the MacBook range has had in recent months. Even so, Apple’s super-slim laptop has received a welcome price and performance tweak that should help broaden its appeal in more ways than one. The MacBook Air’s great strength, of course, is its lightweight, slimline design. Although it has a 13.3in screen with 1280 x 800 resolution, it weighs just 1.36kg and measures 18.8mm at its thickest point. The reduced weight really does make a difference when you’re travelling – it’s like carrying a paper notepad rather than a notebook computer. However, one of the downsides of the ultra-slimline design is that there’s not much room for a cooling system – or a battery either – so the machine has always tended to use relatively modest processors in order to keep power consumption and heat output as low as possible. 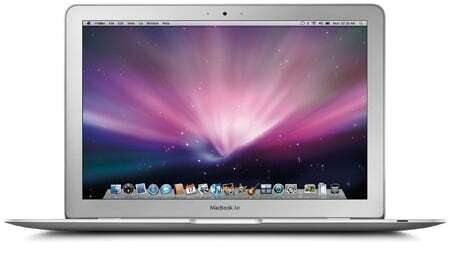 The previous version cost about £1200 with a mere 1.6GHz Core 2 Duo processor, or almost £1800 with a 1.86GHz CPU. In the latest line up, the cheaper of the two models model gets a speed boost from 1.6GHz to 1.86GHz, along with a price cut of about £120 that brings it down to £1149. We tested the faster version of the Air, that breaks the 2GHz barrier for the first time, reaching the giddy heights of 2.13GHz. This model gets a larger price cut from £1761 to £1349. Yes, it’s still expensive, but not out of line with similar top-name brands such as Sony’s ultra-portable Vaio TT or the Fujitsu LifeBook. Both Air models have the same Nvidia GeForce 9400M 256MB graphics core, featured in the previous refresh, plus 2GB of DDR 3 Ram, which is fixed and non-expandable. Our review unit also had a 128GB SSD, while the cheaper option has a conventional 120GB hard disk.